Upside: They look great and are tons of fun! I recently got the chance to try out Snap's hot new Spectacles for a weekend - a wearable device that is essentially a camera resting on your face - and I had a blast! I also learned a ton about a promising future of lightweight wearables and Snap, Inc., the company. Here's what I learned. The second I put the Spectacles on and looked in the mirror I instantly felt a sense of surprise. I was wearing fashion not tech! The design and look of these glasses is impressive. Not only do they look great on but they feel very solid and maybe even a little bit cool, as though you have a little piece of sunny LA resting on your face. The little yellow rings over each lens indicating where the cameras are located can look like a sporty style or branding detail, which is to be expected with most designer sunglasses these days and didn't come off to me as particularly shocking or remarkable. Once I put the Spectacles on I stopped thinking of them as a techie device and more as a pair of sunglasses with 'extra'. They look and feel exactly like sunglasses. I looked all over the packaging but didn't see it listed anywhere whether they include actual UVA protection, so it's not clear if you can replace your current sunglasses with the Spectacles, which would be ideal. And as with regular sunglasses, glasses wearers will have to use contacts to use the Spectacles. Overall, a good look. My initial impression was that Silicon Beach is finally showing Silicon Valley how to make consumer electronics people will want to wear. Getting started with the Spectacles was quick and relatively painless. 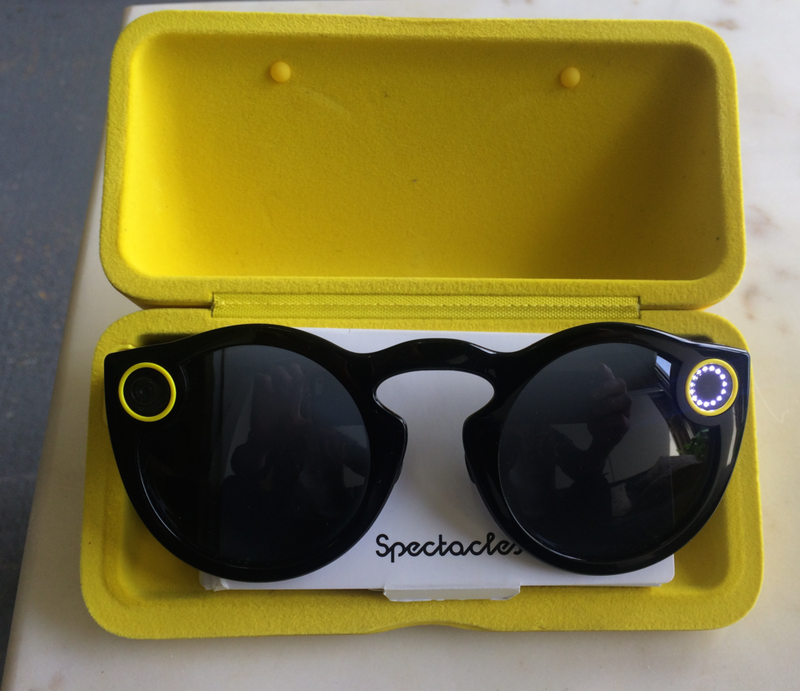 First you pair glasses to your Snapchat app by following the OOBE instructions listed in the booklet inside the charging case (which doubles as a hard glasses case - nifty). The instructions in my booklet weren't exactly inline with the app, but after poking around in the app I eventually found the Snapcode ghost to stare at with the glasses on in order pair the Spectacles. Next I saw the new user tutorial screens which showed me that there is only one interaction with the glasses - take a 10 second video Snap - and one hard button on the glasses you use to do this. This simplified interaction was a relief. The Spectacles were feeling more like a high-end toy than a high-tech gadget. I instantly tried capturing my first Spectacles video Snap and noticed the 10-second blinking 'recording lights' from behind the glasses. Once the lights were done flashing I opened Snapchat to confirm that the video automatically uploaded to the app, and I was ready to go. Immediately I wondered how people would use the glasses to take selfies. Then I realized the only way to do this using the Spectacles would be to take the video Snap in front of a mirror, or have your friend wear the Spectacles and take your video Snap selfie. Naturally I tried both, and the camera angle is too wide for good selfies - with no ability to zoom. Next I encountered my first big challenge: To venture outside and walk around San Francisco with my Spectacles on. Given the history and reputation of previous Google Glass wearers (a.k.a 'Glassholes'), I was nervous at first to wear the Spectacles in public. Would people notice them, think I am potentially recording them, and feel violated? As a female and urban pedestrian the last thing want to do is put myself at risk by advertising something valuable or create unnecessary social tension! But I was brave and went for it. Fortunately, I received only two comments all weekend, expressing general interest and asking me how the glasses work. Each time I made sure to share right away that I was not recording them (when Spectacles are recording they display a noticeable flashing light, but folks new to the glasses would not know that). TOTAL UNINTERRUPTED PRESENCE. This was the biggest revelation of all. This is what a video Snap from made from Spectacles looks like. When you share it in Snapchat, the image takes rectangular shape, not circular. Because you only tap the tactile button once on the side of the glasses take the video Snap, I never had to look down or away, find or read a menu, open my phone, swipe around or get otherwise distracted in order to capture a Snap. All I did was tap on my glasses while walking, the same level of interaction as if I was simply adjusting them. After a day of using the Spectacles their real magic became became clear. They enabled me to capture a moment while never moving my eyes away from what I was looking at. I could capture any moment while maintaining total presence and immersion in that moment and with full attention to the people around me. The Spectacles product team consciously chose to not weight down the glasses experience with editing, stickering, annotating, and sharing of the Snaps - all of this you can easily do later when you want to get back on your phone app. Instead you can can just go about your life wearing the Spectacles and with one button tap capture lots of quick spontaneous video which will look a whole lot more real life - dare I say, reality - and not a bunch of posed and perfected images (unless of course you want to add that in later). As I used the glasses more and more, it became clear that Spectacles aren't just a lightweight way of capturing video, hidden in a form factor that is light-years more fashionable and accessible than we've seen before. Suddenly, Snap, Inc. became a camera company - one that has its eyes on AR. The Spectacles are demonstrating how users can leverage the benefits of technology in a way that is safely, fully integrated to their reality and actually makes sense on their bodies and in a social context. These glasses are just starting to break down the technology wall separating our physically lived lives from our documented, curated digital lives. Snap's Spectacles are clearly suggesting a future towards the intersection of good user experience and enhanced, even augmented, reality. So far, in a much cooler looking head-mounted display. This is NOT a sponsored post. These words reflect the researcher's own experiences and humble opinion. © 2018 User Lens, Inc.